Space technology has a wide range of industry uses within the maritime sector, including the use of Vessel Monitoring Systems (VMS) in the Northern Territory’s (NT) barramundi industry. 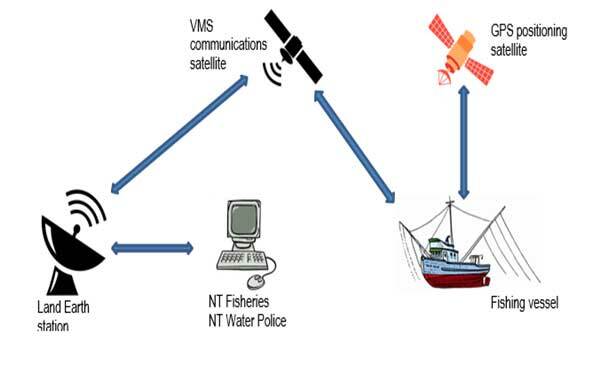 The VMS is an electronic device fitted to commercial fishing vessels providing real time satellite tracking. The tracking is generally accurate to within two meters. The data collected by satellite is relayed to both the NT Police, and the fisheries division within the Department of Primary Industry and Resources (DPIR). This data assists DPIR to manage the long term sustainability of the industry, providing information on the frequency and location of fishing operations. The NT Police can also ensure that fishing vessels aren’t operating in prohibited areas. VMS supports the provision of data used for monitoring compliance, fishing zone usage, adherence to area and seasonal closures, incident detection, and informing research and fisheries management.